Omega-3-acid ethyl esters exist in fish, nuts and plant oils. 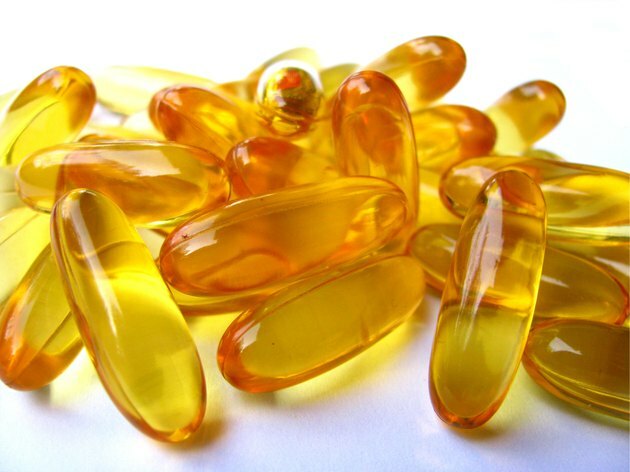 DHA, also known as docosahexaenoic acid, and EPA, or eicosapentaenoic acid, make up the fatty acid components of fish oil supplements, which are a common source for omega-3 oils. Omega-3 oils therapeutically may help lower triglycerides, prevent strokes, treat asthma, cystic fibrosis, depression and schizophrenia, and help reduce plaque in the arteries, lowering the risk of heart attack, MayoClinic.com reports. While doctors often recommend omega-3 oils to people suffering from high cholesterol, they may produce some side effects. The etiology of back pain associated with omega-3 oils is unknown. It may occur and can last for a few days. However, as you continue to use omega-3 oils, back pain usually will subside. If the pain persists, call your health care provider. Lower back pain may signify a health issue such as a kidney infection. Taking omega-3 oil supplements may initially cause headaches, but they should subside with continued use. Headaches classify as non-serious side effects unless they feel severe or persist in which case, you should consult with your physician. Muscle aches often occur as a common side effect to omega-3 oils. You may feel as if you have the flu and your body may generally ache all over. This muscle pain should be short-lived, ending in a couple of days. You may experience burping accompanied by a fishy taste in your mouth as a common side effect to omega-3 oils. The burping may become annoying if it continues. Call your doctor for treatment suggestions. A low-grade fever of less than 101 degrees F may occur as a common side effect of omega-3 oil supplements. The fever should end in the first couple of days as your body adjusts to the supplement. The exact etiology of the fever is unknown, but does occur with fish oil. What Are the Health Benefits of Onion Seeds?